The San Jose Blog: Saturday Stats: San Jose is the Happiest City to Work in for 2014! 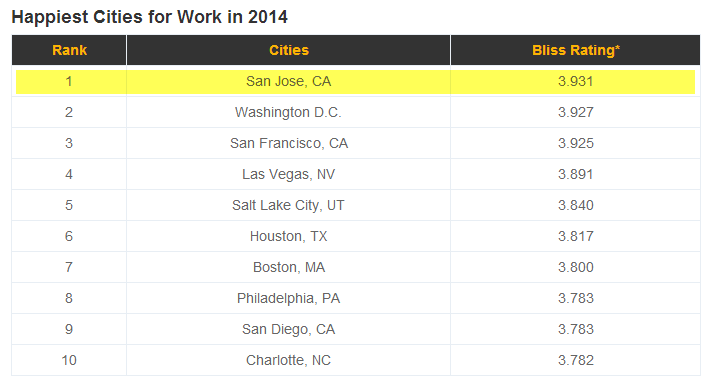 Saturday Stats: San Jose is the Happiest City to Work in for 2014! San Jose just earned another badge for work-related accomplishments. CareerBliss has proclaimed that San Jose is rated the happiest city to work in. This rating came from hundreds of thousands of employee reviews where professionals rated how they felt about where they worked and how it impacted their overall happiness. Key factors such as relationships with bosses, co-workers, job resources, compensation, growth opportunities, company culture, company reputation, and their daily tasks were all factored into the reviews. San Francisco came in third while New York did not rank in the Top 10. Why do I always bring up these two cities? There are really the two in the US we are competing with the most when in comes to job opportunities. Have a look at the full Top 10 below. Source: CareerBliss, Hat Tip to Barclay Livker for sending this in!